The Islanders Talk Benevolent Fund is off to a great start with PA Club event. Well over a hundred people filtered into the P.A. Club in Oak Bluffs on Sunday evening for the Kale Soup Throwdown, where attendees tasted and judged kale dishes made by other Islanders, as the band Sabrina and the Groovers entertained. The contest, sponsored by the Islanders Talk Facebook group, raised $3,627 for the organization’s Benevolent Fund, a fund created by Islanders for Islanders in need, and served as the inaugural event for the group. Given the prospect of how much they could help their community with combined resources, Ms. Burnham took the initiative to open a bank account, secure a tax ID number, and put in place six volunteer board members, one from each town: June Manning (Aquinnah), Jessica Burnham (Edgartown), Margaret Oliveira (Oak Bluffs), Laura Bryant German (Chilmark), Corinne Dorsey (Vineyard Haven), Debby Athearn (West Tisbury) and Lori Robinson Fisher (Page Administrator). The group has since received around $1,700 in straight donations and has amassed over 4,000 members to date. According to Ms. Burnham, the decision to center the first Islanders Talk event around a kale soup contest came out of the popularity of the dish on-Island, and the competitive and proprietary nature of the recipes: Everyone on the Island believes that either they or their families have the best kale soup recipe, all of which are totally different. Since the Chili and Chowder festivals were already popular institutions, the hope was the new nature of the kale soup contest would also draw interest. 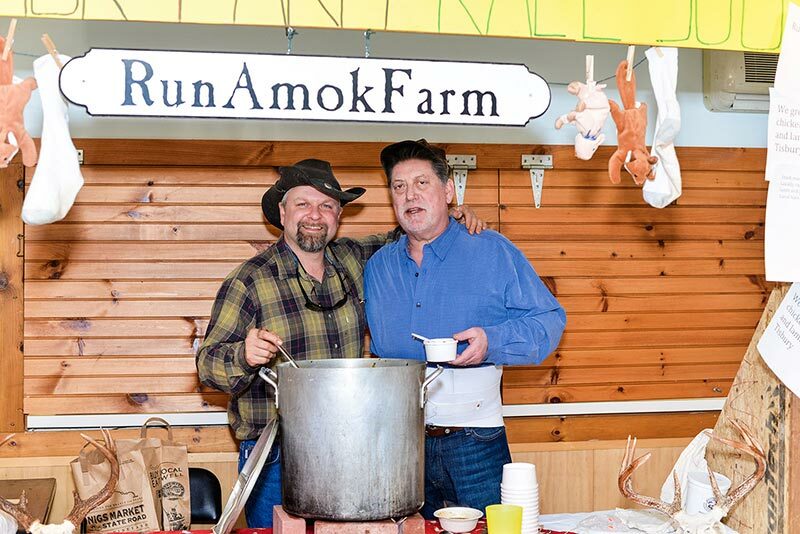 In order to enter the contest, the only requirements for entrants were a completed entry form and four gallons of soup for judging. Some of the other winners included Brian Athearn of West Tisbury, and Steve Jordan of Edgartown of Runamok Farm, who won for Best Display and Presentation. David Oliveira of Oak Bluffs won the “Is It Kale Soup?” category, and was also the people’s choice. Sisters Lisa Healy of Chilmark and Sylvia Capelli of Oak Bluffs earned the judges’ nods for best flavor and taste. Winners walked out with “trophies, plants, and continuous bragging rights,” according to Ms. Burnham and Ms. Robinson Fisher. Several Island businesses participated and contributed donations for auction items, including Sharky’s, Red Cat Kitchen, Green Room, Vineyard Gardens, Copper Wok, Martha’s Vineyard Chowder Co., Sail Ena, and Driftwood Jewelry. At the event, Lori Robinson Fisher, Islanders Talk Facebook page creator and administrator, expressed her disbelief and appreciation for the growing group. She feels that with the success of this first event, so many will benefit from the generosity and support of a community coming together to help one another. “I am so thankful to all of those who attended, participated and donated to this event. We had such generous donors, it was beyond anything we expected. We are already tossing around ideas for another Throwdown, and we have a meeting coming up to discuss it,” said Ms. Robinson Fisher.